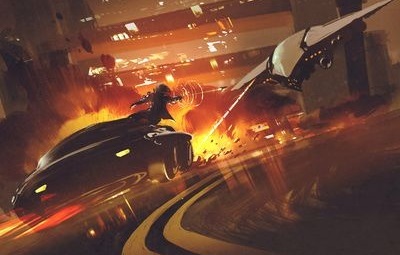 Knowing how to write action scenes is an essential skill for writers in many fiction genres. After all, what would a Suspense or Horror novel be without a chase scene in which the heroine is pursued by the villain? What kind of hard boiled detective doesn't find himself on the losing side of a fistfight while on a case? What would the Western genre be without saloon brawls, train robberies, horseback chases, or shootouts? Not to mention action scenes are essential in any story involving Adventure, whether it's a Thriller, Fantasy, or Science Fiction . As with any scene, what makes an action scene emotionally gripping has to do with the right combination of external and internal factors, as well as sound dramatic structure. An action scene depicts characters engaged in a high stakes physical challenge in order to achieve a goal. The challenge is competitive, urgent, and fast moving. High stakes: The main character needs a strong motivation to win the contest. Most of the time this means creating a threat, which could come from other characters (as in a battle or fight scene), or from the danger inherent in the activity itself (such as a horse race or a car chase). Sometimes the threat is to someone the main character cares about. Competitive: The action should involve conflict with other characters who are trying to defeat, stop, or outperform the main character. Occasionally, a force of nature, such as a hurricane, is the opponent, but usually it is a human being. Urgent: The characters should be racing against the clock, or a competitor to achieve their objective. Fast moving: the urgency generally creates pressure on the characters to accomplish their goals quickly. You may use shorter sentences and fewer descriptive words in actions scenes to create the sense of a fast pace. Of these, the Heist stands apart for relying less on fast action (because of the need for careful timing and precision) and a greater use of suspense. However, it is still a race against the clock. 1. What's the scene about? Good scenes always illustrate an event. By event, I don't mean just a physical act, such as "a fight" or "a chase." Stories that are strongly action-driven generally rely on tight plotting, which means that every scene must describe a turning point in the story. That's what an event is: a turning point, a change. Something must be different by the end of the scene, and that change will send the story in a new direction. Events can be external, such as the death of a character, the destruction of something important, a capture or escape, a change in circumstances, or the obtaining of an object or bit of information. An event can also be internal, such as a decision, realization, or epiphany. Or an event can show a turning point in a relationship, such as a bonding or a betrayal. Either way, you want to make sure something happens in the course of the action, such that things are different going forward. 2. Where will it take place? Where you set your action scene matters because the terrain has a big affect on what your characters can do. For this reason, a chase scene involving cars on a freeway will have a different feel than one in which two submarines chase each other in deep water or two students chase each other through a crowded library. Of course, you have to choose terrain that makes sense for your story, but sometimes it helps to ask yourself what is the most interesting place you could choose to set your action. For example, Alfred Hitchcock's classic film North by Northwest ends with a chase scene on Mount Rushmore, a setting chosen for its uniqueness. But even if your terrain is less exotic, it is important to have a clear picture of it in mind. For instance, is it indoors or outside? Does it take place in mud, or on stairs, carpet, or gravel? What time of day or season is it? Must the characters be on foot or could they use vehicles? Is the space empty or filled with objects that offer possibilities? And how will these factors affect the action? Hazards or barriers to escape. Materials that could be become makeshift weapons, traps, or tools. Things to be protected, such as bystanders or valuable objects. Things that might be destroyed in the course of the action (such as bystanders or valuable objects). Impediments, such as weather, lighting, traffic, dangerous animals, or booby traps. The time and effort required to cross the terrain. In fact, it is often a good idea to create a map or diagram of the terrain to help you envision the action as it will unfold. 3. Who are the people involved? 4. What sort of odds will you give your characters? However, that doesn't mean your main character must have these traits in his/her favour. In fact, readers often prefer stories in which the main character wins when the odds are against him. 5. Who Should Have The Moral High Ground? Perceived underdogs (because who hasn't felt the unfairness of being an underdog at one time?). Fighting for a noble cause (such as the protection of the innocent or those even more defenseless). In danger of suffering a serious consequence if they fail. Likable (because they are moral, admirable, or sympathetic). Non-aggressors (who only fight or take action in self-defense or when forced to). In fact, throwing the first punch or firing the first shot can cause a character to lose some of the moral high ground. Generally, you want your main character to have the moral high ground. But that doesn't mean he/she must win every contest. Often it's better if the main character loses a couple of times, or if a contest early in the story ends in a draw -- so that when the character wins the final contest at the climax, the victory seems all the sweeter. 6.How well do you understand the activities you will write about? Obviously, if you are going to write stories about characters who get themselves involved in action scenes, you need some expertise or experience in the activities they will engage in, so you don't accidentally have your characters do things that are impossible or that make them look less competent than they should. So if you choose a main character who is a Formula One driver, Eagle Scout, or kung fu master, you had better know something about auto racing, outdoor survival, or kung fu. At the very least, you have some research to do. Obviously, it is easier to write authentically about a character who has less experience and expertise than you do than to write about one who has more. But even if your character is a couch potato who just happens to find himself in a situation where action is required, you have to know enough about the activities in question to know what is possible or realistic. You might need to join a club dedicated to such activities (so you can try them yourself), or interview people who have expertise. 7. What Will Go Wrong? Any scene in which a character tries to do something and succeeds exactly according to his plan risks being a little dull. This is especially true for action scenes. So when you're writing your scene, look for places where things go wrong for the characters, where surprises and accidents happen, forcing the characters to improvise or change direction. Readers love seeing how characters handle unexpected problems -- whether they can pull success from the jaws of defeat. Okay, let's assume that you have done your preparation and answered those seven questions. You know what the scene is about, where it takes place, and who is involved. You also know enough about the type of action to write it authentically. The next step is to consider how to structure an effective action scene. And for that, turn to the next article, How to Write a Fight Scene (which covers the structure of action scenes as well).